: On the consequences of the Peyton Manning signing, the realities of the NFL, and a fan’s ulterior dream deferred”. In Esquire. Read it. Here. Read it. For yourself. Tweet it. If you want to share the love. 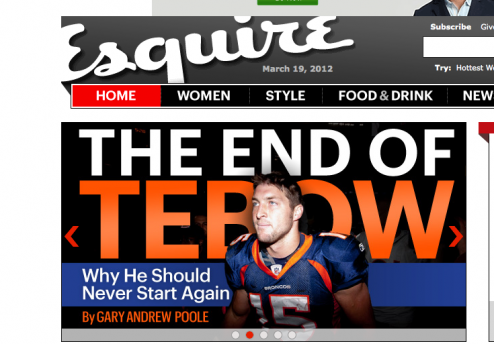 This entry was written by Poole, posted on March 19, 2012 at 4:16 pm, filed under Tebow. Leave a comment or view the discussion at the permalink and follow any comments with the RSS feed for this post.